For the general language group of Fujian (Hokkien) province, see Min Chinese. For other uses, see Hokkien (disambiguation). Hokkien (/ˈhɒkiɛn, hɒˈkiːɛn/;[a] from Chinese: 福建話; pinyin: Fújiànhuà; Pe̍h-ōe-jī: Hok-kiàn-ōe)[b] or Minnan language (閩南語/闽南语), is a Southern Min Chinese dialect group originating from the Minnan region in the south-eastern part of Fujian Province in Southeastern China, and spoken widely there. It is also spoken widely in Taiwan and by the Chinese diaspora in Malaysia, Singapore, Indonesia, the Philippines and other parts of Southeast Asia, and by other overseas Chinese all over the world. It is the mainstream form of Southern Min. ~35 million in Southern Fujian, Taiwan and Shanwei city, 5-6 million in other overseas countries. Distribution of Southern Min languages. Quanzhang (Hokkien) is dark green. Distribution of Quanzhang (Minnan Proper) dialects within Fujian Province and Taiwan. Lengna dialect (Longyan Min) is a variant of Southern Min that is spoken in the urban cities in the east of Longyan prefecture. It is closely related to Teochew, though it has limited mutual intelligibility with it, whereas it is more distantly related to other variants such as Putian dialect, Hainanese and Leizhou dialect due to historical influences. Hokkien historically served as the lingua franca amongst overseas Chinese communities of all dialects and subgroups in Southeast Asia, and remains today as the most spoken variety of Chinese in the region, including in Singapore, Malaysia, Indonesia, Philippines and some parts of Indochina (particularly Thailand, Laos and Cambodia). The Betawi Malay language, spoken by some five million people in and around the Indonesian capital Jakarta, includes numerous Hokkien loanwords due to the significant influence of the Chinese Indonesian diaspora, most of whom are of Hokkien ancestry and origin. Bân-lâm-gú / Bân-lâm-ōe (闽南语/闽南话; 閩南語/閩南話, literally 'language or speech of Southern Min') in Mainland China and Taiwan. Tâi-gí (臺語, literally 'Taiwanese language') in Taiwan. Hok-kiàn-ōe (福建话; 福建話, literally 'Fujian speech') in Burma, Singapore, Malaysia and Indonesia. Lán-lâng-ōe (咱儂話, literally 'our people's language') in the Philippines. In parts of Southeast Asia and in the English-speaking communities, the term Hokkien ([hɔk˥kiɛn˨˩]) is etymologically derived from the Southern Min pronunciation for Fujian (Chinese: 福建; pinyin: Fújiàn; Pe̍h-ōe-jī: Hok-kiàn), the province from which the language hails. In Southeast Asia and the English press, Hokkien is used in common parlance to refer to the Southern Min dialects of southern Fujian, and does not include reference to dialects of other Sinitic branches also present in Fujian such as the Fuzhou dialect (Eastern Min), Putian dialect, Northern Min, Gan Chinese or Hakka. In Chinese linguistics, these dialects are known by their classification under the Quanzhang division (Chinese: 泉漳片; pinyin: Quánzhāng piàn) of Min Nan, which comes from the first characters of the two main Hokkien urban centers of Quanzhou and Zhangzhou. Hokkien originated in the southern area of Fujian province, an important center for trade and migration, and has since become one of the most common Chinese varieties overseas. The major pole of Hokkien varieties outside of Fujian is Taiwan, where, during the 200 years of Qing dynasty rule, thousands of immigrants from Fujian arrived yearly. The Taiwanese dialect mostly has origins with the Quanzhou and Zhangzhou variants, but since then, the Amoy dialect, also known as the Xiamen dialect, is becoming the modern prestige standard for the language in Mainland China. Both Amoy and Xiamen come from the Chinese name of the city (simplified Chinese: 厦门; traditional Chinese: 廈門; pinyin: Xiàmén; Pe̍h-ōe-jī: Ē-mûi); the former is from Zhangzhou Hokkien, whereas the later comes from Mandarin. There are many Minnan (Hokkien) speakers among overseas Chinese in Southeast Asia as well as in the United States (Hoklo Americans). Many ethnic Han Chinese emigrants to the region were Hoklo from southern Fujian, and brought the language to what is now Burma (Myanmar), Indonesia (the former Dutch East Indies) and present day Malaysia and Singapore (formerly Malaya and the British Straits Settlements). Many of the Minnan dialects of this region are highly similar to Xiamen dialect (Amoy) and Taiwanese Hokkien with the exception of foreign loanwords. Hokkien is reportedly the native language of up to 80% of the Chinese people in the Philippines, among which is known locally as Lan-nang or Lán-lâng-oē ("Our people’s language"). Hokkien speakers form the largest group of overseas Chinese in Singapore, Malaysia, Indonesia and Philippines. Southern Fujian is home to three principal Minnan Proper (Hokkien) dialects: Chinchew, Amoy, Chiangchew, originating from the cities of Quanzhou, Xiamen and Zhangzhou (respectively). Traditionally speaking, Quanzhou dialect spoken in Quanzhou is the Traditional Standard Minnan, it is the dialect that is used in and Liyuan Opera [zh] (梨园戏) and Nanying music [zh] (南音). Being the Traditional Standard Minnan, Quanzhou dialect is considered to have the purest accent and the most conservative Minnan dialect. In the late 18th to the early 19th century, Xiamen (Amoy) became the principal city of southern Fujian. Xiamen (Amoy) dialect is adopted as the Modern Standard Minnan. It is a hybrid of the Quanzhou and Zhangzhou dialects. It has played an influential role in history, especially in the relations of Western nations with China, and was one of the most frequently learnt dialect of Quanzhang variety by Westerners during the second half of the 19th century and the early 20th century. The Modern Standard form of Quanzhang accent spoken around the city of Tainan in Taiwan is a hybrid of the Quanzhou and Zhangzhou dialects, in the same way as the Amoy dialect. All Quanzhang dialects spoken throughout the whole of Taiwan are collectively known as Taiwanese Hokkien or just the Taiwanese language. Used by a majority of the population, it bears much importance from a socio-political perspective, forming the second (and perhaps today most significant) major pole of the language due to the popularity of Taiwanese-language media. The varieties of Hokkien in Southeast Asia originate from these dialects. The Singaporeans, Southern Malaysians and people in Indonesia's Riau and surrounding islands variant is from the Quanzhou area. They speak a distinct form of Quanzhou Hokkien called Southern Peninsular Malaysian Hokkien (SPMH). Among ethnic Chinese inhabitants of Penang, and other states in Northern Malaysia and Medan, with other areas in North Sumatra, Indonesia, a distinct form of Zhangzhou Hokkien has developed. In Penang, it is called Penang Hokkien while across the Malacca Strait in Medan, an almost identical variant is known as Medan Hokkien. The Philippines variant is mostly from Quanzhou or Amoy (Xiamen), as most of their ancestors are from the aforementioned area. Variants of Hokkien dialects can be traced to two sources of origin: Quanzhou and Zhangzhou. Both Amoy and most Taiwanese are based on a mixture of Quanzhou and Zhangzhou dialects, while the rest of the Hokkien dialects spoken in South East Asia are either derived from Quanzhou and Zhangzhou, or based on a mixture of both dialects. During the Three Kingdoms period of ancient China, there was constant warfare occurring in the Central Plain of China. Northerners began to enter into Fujian region, causing the region to incorporate parts of northern Chinese dialects. However, the massive migration of northern Han Chinese into Fujian region mainly occurred after the Disaster of Yongjia. The Jìn court fled from the north to the south, causing large numbers of northern Han Chinese to move into Fujian region. They brought the Old Chinese spoken in the Central Plain of China from the prehistoric era to the 3rd century into Fujian. This then gradually evolved into the Quanzhou dialect. In 677 (during the reign of Emperor Gaozong), Chen Zheng, together with his son Chen Yuanguang, led a military expedition to suppress a rebellion of the She people. In 885, (during the reign of Emperor Xizong of Tang), the two brothers Wang Chao and Wang Shenzhi, led a military expedition force to suppress the Huang Chao rebellion. These two waves of migration from the north brought the language of northern Middle Chinese into the Fujian region. This then gradually evolved into the Zhangzhou dialect. 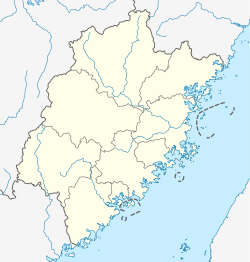 The Amoy dialect is the main dialect spoken in the Chinese city of Xiamen (formerly romanized and natively pronounced as "Amoy") and its surrounding regions of Tong'an and Xiang'an, both of which are now included in the greater Xiamen area. This dialect developed in the late Ming dynasty when Xiamen was increasingly taking over Quanzhou's position as the main port of trade in southeastern China. Quanzhou traders began traveling southwards to Xiamen to carry on their businesses while Zhangzhou peasants began traveling northwards to Xiamen in search of job opportunities. A need for a common language arose. The Quanzhou and Zhangzhou varieties are similar in many ways (as can be seen from the common place of Henan Luoyang where they originated), but due to differences in accents, communication can be a problem. Quanzhou businessmen considered their speech to be the prestige accent and considered Zhangzhou's to be a village dialect. Over the centuries, dialect leveling occurred and the two speeches mixed to produce the Amoy dialect. Several playscripts survive from the late 16th century, written in a mixture of Quanzhou and Chaozhou dialects. The most important is the Romance of the Litchi Mirror, with extant manuscripts dating from 1566 and 1581. Diccionarium Sino-Hispanicum (1604), a Spanish-Hokkien dictionary, giving equivalent words, but not definitions. Doctrina Christiana en letra y lengua china (1607), a Hokkien translation of the Doctrina Christiana. Bocabulario de la lengua sangleya (c. 1617), a Spanish-Hokkien dictionary, with definitions. Arte de la Lengua Chiõ Chiu (1620), a grammar written by a Spanish missionary in the Philippines. These texts appear to record a Zhangzhou dialect, from the area of Haicheng (an old port that is now part of Longhai). Huìyīn Miàowù (彙音妙悟 "Understanding of the collected sounds") was written around 1800 by Huang Qian (黃謙), and describes the Quanzhou dialect. The oldest extant edition dates from 1831. Huìjí yǎsútōng shíwǔyīn (彙集雅俗通十五音 "Compilation of the fifteen elegant and vulgar sounds") by Xie Xiulan (謝秀嵐) describes the Zhangzhou dialect. The oldest extant edition dates from 1818. Walter Henry Medhurst based his 1832 dictionary on the latter work. Hokkien has one of the most diverse phoneme inventories among Chinese varieties, with more consonants than Standard Mandarin, Cantonese and Shanghainese. Vowels are more-or-less similar to that of Standard Mandarin. Hokkien varieties retain many pronunciations that are no longer found in other Chinese varieties. These include the retention of the /t/ initial, which is now /tʂ/ (Pinyin 'zh') in Mandarin (e.g. 'bamboo' 竹 is tik, but zhú in Mandarin), having disappeared before the 6th century in other Chinese varieties. Southern Min has aspirated, unaspirated as well as voiced consonant initials. For example, the word khui (開; "open") and kuiⁿ (關; "close") have the same vowel but differ only by aspiration of the initial and nasality of the vowel. In addition, Southern Min has labial initial consonants such as m in m̄-sī (毋是; "is not"). Another example is 'da-po͘-kiáⁿ (查埔囝; "boy") and cha-bó͘-kiáⁿ (查某囝; "girl"), which differ in the second syllable in consonant voicing and in tone. Unlike Mandarin, Hokkien retains all the final consonants corresponding to those of Middle Chinese. While Mandarin only preserves the n and ŋ finals, Southern Min also preserves the m, p, t and k finals and developed the ʔ (glottal stop). The vowels of Hokkien are /i, y, ɨ, u, e, ə, ɤ, o, ɛ, ɔ, a, ɐ/. The following table illustrates some of the more commonly seen vowel shifts. Characters with the same vowel are shown in parentheses. In general, Hokkien dialects have 5 to 7 phonemic tones. According to the traditional Chinese system, however, there are 7 to 9 tones if the two additional entering tones (see the discussion on Chinese tone). Tone sandhi is extensive. There are minor variations between the Quanzhou and Zhangzhou tone systems. Taiwanese tones follow the patterns of Amoy or Quanzhou, depending on the area of Taiwan. Many dialects have an additional phonemic tone ("tone 9" according to the traditional reckoning), used only in special or foreign loan words. Similar to England, the Hokkien language (Minnan) is spoken in a variatiety of accents and dialects across the Minnan region. The Hokkien spoken in most areas of the three counties of southern Zhangzhou have merged the coda finals -n and -ng into -ng. The initial consonant j (dz and dʑ) is not present in most dialects of Hokkien spoken in Quanzhou, having been merged into the d or l initials. The -ik or -ɪk final consonant that is preserved in the native Hokkien dialects of Zhangzhou and Xiamen is also preserved in the Nan'an dialect (色, 德, 竹) but lost in most dialects of Quanzhou Hokkien. The Amoy dialect (Xiamen) is a hybrid of the Quanzhou and Zhangzhou dialects. Taiwanese is also a hybrid of these two dialects. Taiwanese in northern and coastal Taiwan tends to be based on the Quanzhou variety, whereas the Taiwanese spoken in central, south and inland Taiwan tends to be based on Zhangzhou speech. There are minor variations in pronunciation and vocabulary between Quanzhou and Zhangzhou dialects. The grammar is generally the same. Additionally, extensive contact with the Japanese language has left a legacy of Japanese loanwords in Taiwanese Hokkien. On the other hand, the variants spoken in Singapore and Malaysia have a substantial number of loanwords from Malay and to a lesser extent, from English and other Chinese varieties, such as the closely related Teochew and some Cantonese. Penang Hokkien and Medan Hokkien are based on Zhangzhou dialect, whereas Southern Peninsular Malaysian Hokkien is based on Quanzhou dialect. The Quanzhou dialect, Xiamen dialect, Zhangzhou dialect and Taiwanese are generally mutually intelligible. The overseas varieties such as Penang Hokkien and Singaporean Hokkien are slightly less intelligible to speakers of mainland Min Nan and Taiwanese dialects due to the existence of foreign loanwords. Although the Min Nan varieties of Teochew and Amoy are 84% phonetically similar including the pronunciations of un-used Chinese characters as well as same characters used for different meanings, and 34% lexically similar,, Teochew has only 51% intelligibility with the Tong'an Xiamen dialect of the Hokkien language (Cheng 1997) whereas Mandarin and Amoy Min Nan are 62% phonetically similar and 15% lexically similar. In comparison, German and English are 60% lexically similar. Hainanese, which is sometimes considered Southern Min, has almost no mutual intelligibility with any form of Hokkien. Hokkien is an analytic language; in a sentence, the arrangement of words is important to its meaning. A basic sentence follows the subject–verb–object pattern (i.e. a subject is followed by a verb then by an object), though this order is often violated because Hokkien dialects are topic-prominent. Unlike synthetic languages, seldom do words indicate time, gender and plural by inflection. Instead, these concepts are expressed through adverbs, aspect markers, and grammatical particles, or are deduced from the context. Different particles are added to a sentence to further specify its status or intonation. A verb itself indicates no grammatical tense. The time can be explicitly shown with time-indicating adverbs. Certain exceptions exist, however, according to the pragmatic interpretation of a verb's meaning. Additionally, an optional aspect particle can be appended to a verb to indicate the state of an action. Appending interrogative or exclamative particles to a sentence turns a statement into a question or shows the attitudes of the speaker. Hokkien dialects preserve certain grammatical reflexes and patterns reminiscent of the broad stage of Archaic Chinese. This includes the serialization of verb phrases (direct linkage of verbs and verb phrases) and the infrequency of nominalization, both similar to Archaic Chinese grammar. "Did you go to buy a watch?" Choice of grammatical function words also varies significantly among the Hokkien dialects. For instance, 乞 khit (denoting the causative, passive or dative) is retained in Jinjiang (also unique to the Jinjiang dialect is 度 thoo) and in Jieyang, but not in Longxi and Xiamen, whose dialects use 互 (hoo) instead. "My husband's surname is Tan." Reflexive pronouns are made by appending the pronouns ka-kī (家己) or chū-kí (自己). With noun complements, the verb sī (是) serves as the verb "to be". "Yesterday was the Mid-Autumn festival." "I am here waiting for you." "He's sleeping at home now." "He does not have any money." The majority of Hokkien vocabulary is monosyllabic. [better source needed] Many Hokkien words have cognates in other Chinese varieties. That said, there are also many indigenous words that are unique to Hokkien and are potentially not of Sino-Tibetan origin, while others are shared by all the Min dialects (e.g. 'congee' is 糜 mê, bôe, bê, not 粥 zhōu, as in other dialects). In other cases, the same word can have different meanings in Hokkien and standard written Chinese. Similarly, depending on the region Hokkien is spoken in, loanwords from local languages (Malay, Tagalog, Burmese, among others), as well as other Chinese dialects (such as Southern Chinese dialects like Cantonese and Teochew), are commonly integrated into the vocabulary of Hokkien dialects. The existence of literary and colloquial readings is a prominent feature of some Hokkien dialects and indeed in many Sinitic varieties in the south. The bulk of literary readings (文讀, bûn-tha̍k), based on pronunciations of the vernacular during the Tang Dynasty, are mainly used in formal phrases and written language (e.g. philosophical concepts, surnames, and some place names), while the colloquial (or vernacular) ones (白讀, pe̍h-tha̍k) are basically used in spoken language and vulgar phrases. Literary readings are more similar to the pronunciations of the Tang standard of Middle Chinese than their colloquial equivalents. However, some dialects of Hokkien, such as Penang Hokkien as well as Philippine Hokkien overwhelmingly favor colloquial readings. For example, in both Penang Hokkien and Philippine Hokkien, the characters for 'university,' 大學, are pronounced tōa-o̍h (colloquial readings for both characters), instead of the literary reading tāi-ha̍k, which is common in Taiwanese and Mainland Chinese dialects. The pronounced divergence between literary and colloquial pronunciations found in Hokkien dialects is attributed to the presence of several strata in the Min lexicon. The earliest, colloquial stratum is traced to the Han dynasty (206 BCE - 220 CE); the second colloquial one comes from the period of the Southern and Northern Dynasties (420 - 589 CE); the third stratum of pronunciations (typically literary ones) comes from the Tang Dynasty (618–907 CE) and is based on the prestige dialect of Chang'an (modern day Xi'an), its capital. This feature extends to Chinese numerals, which have both literary and colloquial readings. Literary readings are typically used when the numerals are read out loud (e.g. phone numbers), while colloquial readings are used for counting items. Quite a few words from the variety of Old Chinese spoken in the state of Wu, where the ancestral language of Min and Wu dialect families originated, and later words from Middle Chinese as well, have retained the original meanings in Hokkien, while many of their counterparts in Mandarin Chinese have either fallen out of daily use, have been substituted with other words (some of which are borrowed from other languages while others are new developments), or have developed newer meanings. The same may be said of Hokkien as well, since some lexical meaning evolved in step with Mandarin while others are wholly innovative developments. Loanwords are not unusual among Hokkien dialects, as speakers readily adopted indigenous terms of the languages they came in contact with. As a result, there is a plethora of loanwords that are not mutually comprehensible among Hokkien dialects. 茶箍 (Sap-bûn) from Malay sabun from Arabic ṣābūn (صابون). Hokkien originated from Quanzhou. [better source needed] After the Opium War in 1842, Xiamen (Amoy) became one of the major treaty ports to be opened for trade with the outside world. From the mid-19th century onwards, Xiamen slowly developed to become the political and economical center of the Hokkien speaking region in China. This caused Amoy dialect to gradually replace the position of dialect variants from Quanzhou and Zhangzhou. From the mid-19th century until the end of World War II, western diplomats usually learned Amoy as the preferred dialect if they were to communicate with the Hokkien-speaking populace in China or South-East Asia. In the 1940s and 1950s, Taiwan[who?] also held Amoy Minnan as its standard and tended to incline towards Amoy dialect. However, from the 1980s onwards, the development of Taiwanese Min Nan pop music and media industry in Taiwan caused the Hokkien cultural hub to shift from Xiamen to Taiwan. The flourishing Taiwanese Min Nan entertainment and media industry from Taiwan in the 1990s and early 21st century led Taiwan to emerge as the new significant cultural hub for Hokkien. In the 1990s, marked by the liberalization of language development and mother tongue movement in Taiwan, Taiwanese Hokkien had undergone a fast pace in its development. In 1993, Taiwan became the first region in the world to implement the teaching of Taiwanese Hokkien in Taiwanese schools. In 2001, the local Taiwanese language program was further extended to all schools in Taiwan, and Taiwanese Hokkien became one of the compulsory local Taiwanese languages to be learned in schools. The mother tongue movement in Taiwan even influenced Xiamen (Amoy) to the point that in 2010, Xiamen also began to implement the teaching of Hokkien dialect in its schools. In 2007, the Ministry of Education in Taiwan also completed the standardization of Chinese characters used for writing Hokkien and developed Tai-lo as the standard Hokkien pronunciation and romanization guide. A number of universities in Taiwan also offer Taiwanese degree courses for training Hokkien-fluent talents to work for the Hokkien media industry and education. Taiwan also has its own Hokkien literary and cultural circles whereby Hokkien poets and writers compose poetry or literature in Hokkien. Thus by the 21st century, Taiwan is one of the most significant Hokkien cultural hubs of the world. The historical changes and development in Taiwan had led Taiwanese Hokkien to become the more influential pole of the Hokkien dialect after the mid-20th century. Today, Taiwanese prestige dialect (Taiyu Youshiqiang/Tongxinqiang 台語優勢腔/通行腔), which is based on Tainan variant and heard on Taiwanese Hokkien media. Hokkien dialects are typically written using Chinese characters (漢字, Hàn-jī). However, the written script was and remains adapted to the literary form, which is based on classical Chinese, not the vernacular and spoken form. Furthermore, the character inventory used for Mandarin (standard written Chinese) does not correspond to Hokkien words, and there are a large number of informal characters (替字, thè-jī or thòe-jī; 'substitute characters') which are unique to Hokkien (as is the case with Cantonese). For instance, about 20 to 25% of Taiwanese morphemes lack an appropriate or standard Chinese character. While most Hokkien morphemes have standard designated characters, they are not always etymological or phono-semantic. Similar-sounding, similar-meaning or rare characters are commonly borrowed or substituted to represent a particular morpheme. Examples include "beautiful" (美 bí is the literary form), whose vernacular morpheme suí is represented by characters like 媠 (an obsolete character), 婎 (a vernacular reading of this character) and even 水 (transliteration of the sound suí), or "tall" (高 ko is the literary form), whose morpheme kôan is 懸. Common grammatical particles are not exempt; the negation particle m̄ (not) is variously represented by 毋, 呣 or 唔, among others. In other cases, characters are invented to represent a particular morpheme (a common example is the character 𪜶 in, which represents the personal pronoun "they"). In addition, some characters have multiple and unrelated pronunciations, adapted to represent Hokkien words. For example, the Hokkien word bah ("meat") has been reduced to the character 肉, which has etymologically unrelated colloquial and literary readings (he̍k and jio̍k, respectively). Another case is the word 'to eat,' chia̍h, which is often transcribed in Taiwanese newspapers and media as 呷 (a Mandarin transliteration, xiā, to approximate the Hokkien term), even though its recommended character in dictionaries is 食. Moreover, unlike Cantonese, Hokkien does not have a universally accepted standardized character set. Thus, there is some variation in the characters used to express certain words and characters can be ambiguous in meaning. In 2007, the Ministry of Education of the Republic of China formulated and released a standard character set to overcome these difficulties. These standard Chinese characters for writing Taiwanese Hokkien are now taught in schools in Taiwan. Hokkien, especially Taiwanese Hokkien, is sometimes written in the Latin script using one of several alphabets. Of these the most popular is POJ, developed first by Presbyterian missionaries in China and later by the indigenous Presbyterian Church in Taiwan. Use of this script and orthography has been actively promoted since the late 19th century. The use of a mixed script of Han characters and Latin letters is also seen, though remains uncommon. Other Latin-based alphabets also exist. Min Nan texts, all Hokkien, can be dated back to the 16th century. One example is the Doctrina Christiana en letra y lengua china, presumably written after 1587 by the Spanish Dominicans in the Philippines. Another is a Ming Dynasty script of a play called Tale of the Lychee Mirror (1566), supposedly the earliest Southern Min colloquial text, although it is written in Teochew dialect. Taiwan has developed a Latin alphabet for Taiwanese Hokkien, derived from POJ, known as Tai-lo. Since 2006, it has been officially promoted by Taiwan's Ministry of Education and taught in Taiwanese schools. Xiamen University has also developed an alphabet based on Pinyin called Bbánlám pìngyīm. The character for the third person pronoun (they) in some Hokkien dialects, 𪜶 (in), is now supported by the Unicode Standard at U+2A736. Hokkien is registered as "Southern Min" per RFC 3066 as zh-min-nan. When writing Hokkien in Chinese characters, some writers create 'new' characters when they consider it impossible to use directly or borrow existing ones; this corresponds to similar practices in character usage in Cantonese, Vietnamese chữ nôm, Korean hanja and Japanese kanji. Some of these are not encoded in Unicode (or the corresponding ISO/IEC 10646: Universal Character Set), thus creating problems in computer processing. All Latin characters required by Pe̍h-ōe-jī can be represented using Unicode (or the corresponding ISO/IEC 10646: Universal Character Set), using precomposed or combining (diacritics) characters. Prior to June 2004, the vowel akin to but more open than o, written with a dot above right, was not encoded. The usual workaround was to use the (stand-alone; spacing) character Interpunct (U+00B7, ·) or less commonly the combining character dot above (U+0307). As these are far from ideal, since 1997 proposals have been submitted to the ISO/IEC working group in charge of ISO/IEC 10646—namely, ISO/IEC JTC1/SC2/WG2—to encode a new combining character dot above right. This is now officially assigned to U+0358 (see documents N1593, N2507, N2628, N2699, and N2713). Font support is expected to follow. Hokkien (or Min Nan) can trace its roots through the Tang Dynasty and also even further to the people of the Minyue, the indigenous non-Han people of modern-day Fujian. Min Nan (Hokkien) people call themselves "Tang people," (唐人; Tn̂g-lâng) which is synonymous to "Chinese people". Because of the widespread influence of the Tang culture during the great Tang dynasty, there are today still many Min Nan pronunciations of words shared by the Vietnamese, Korean and Japanese languages. 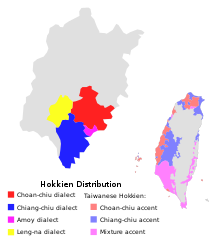 In 2002, the Taiwan Solidarity Union, a party with about 10% of the Legislative Yuan seats at the time, suggested making Taiwanese a second official language. This proposal encountered strong opposition not only from Mainlander groups but also from Hakka and Taiwanese aboriginal groups who felt that it would slight their home languages. Because of these objections, support for this measure was lukewarm among moderate Taiwan independence supporters, and the proposal did not pass. Hokkien was finally made an official language of Taiwan in 2018 by the ruling DPP government. ^ "Draft national language development act clears legislative floor". ltn.com.tw. ^ Hammarström, Harald; Forkel, Robert; Haspelmath, Martin, eds. (2017). "Quanzhang". Glottolog 3.0. Jena, Germany: Max Planck Institute for the Science of Human History. ^ Hammarström, Harald; Forkel, Robert; Haspelmath, Martin, eds. (2017). "Fukienese". Glottolog 3.0. Jena, Germany: Max Planck Institute for the Science of Human History. ^ West (2010), pp. 289-90. ^ "2010 population and household census in Taiwan" (PDF). Government of Taiwan (in Chinese). Taiwan Ministry of Education. Retrieved 5 December 2018. ^ Yan, Margaret Mian (2006). Introduction to Chinese Dialectology. LINCOM Europa. p. 120. ISBN 978-3-89586-629-6. ^ a b Chappell, Hilary; Peyraube, Alain (2006). "The analytic causatives of early modern Southern Min in diachronic perspective". In Ho, D.-a. ; Cheung, S.; Pan, W.; Wu, F. (eds.). Linguistic Studies in Chinese and Neighboring Languages. Taipei: Institute of Linguistics, Academia Sinica. pp. 973–1011. ^ Lien, Chinfa (2015). "Min languages". In Wang, William S.-Y. ; Sun, Chaofen (eds.). The Oxford Handbook of Chinese Linguistics. Oxford University Press. pp. 160–172. ISBN 978-0-19-985633-6. ^ Klöter, Henning (2011). The Language of the Sangleys: A Chinese Vernacular in Missionary Sources of the Seventeenth Century. BRILL. ISBN 978-90-04-18493-0. ^ Yue, Anne O. (1999). "The Min translation of the Doctrina Christiana". Contemporary Studies on the Min Dialects. Journal of Chinese Linguistics Monograph Series. 14. Chinese University Press. pp. 42–76. JSTOR 23833463. ^ Van der Loon, Piet (1966). "The Manila Incunabula and Early Hokkien Studies, Part 1" (PDF). Asia Major New Series. 12 (1): 1–43. ^ Van der Loon, Piet (1967). "The Manila Incunabula and Early Hokkien Studies, Part 2" (PDF). Asia Major New Series. 13 (1): 95–186. ^ Klöter, Henning (2005). Written Taiwanese. Otto Harrassowitz. pp. 64–65. ISBN 978-3-447-05093-7. ^ Kane, Daniel (2006). The Chinese language: its history and current usage. Tuttle Publishing. pp. 100–102. ISBN 978-0-8048-3853-5. ^ for Teochew Peng'Im on the word 'two', ri6 can also be written as dzi6. ^ 無標題文件 (in Chinese). Ntcu.edu.tw. 1 August 2007. Retrieved 16 September 2010. ^ 周長楫 (2006). 闽南方言大词典 (in Chinese). 福建人民出版社. pp. 17, 28. ISBN 7-211-03896-9. ^ "南安方言副词分析". Fujian Normal University. 2010. ^ a b "Chinese, Min Nan". Ethnologue. Retrieved 12 June 2018. ^ "German". Ethnologue. Retrieved 16 September 2010. ^ Ratte, Alexander T. (May 2009). "A DIALECTAL AND PHONOLOGICAL ANALYSIS OF PENGHU TAIWANESE" (PDF). Williamstown, Massachusetts: Williams College: 4. ^ Li, Y.C. (1986). "Historical significance of certain distinct grammatical features in Taiwanese". In John McCoy, Timothy Light (ed.). Contributions to Sino-Tibetan studies. Brill Archive. ISBN 978-90-04-07850-5. ^ Lien, Chinfa (2002). "Grammatical Function Words 乞, 度, 共, 甲, 將 and 力 in Li Jing Ji 荔鏡記 and their Development in Southern Min" (PDF). Papers from the Third International Conference on Sinology. National Tsing Hua University: 179–216. ^ Klöter, Henning (2005). Written Taiwanese. Otto Harrassowitz Verlag. ISBN 978-3-447-05093-7. ^ Lim, Beng Soon. "Malay Lexicalized Items in Penang Peranakan Hokkien" (PDF). Singapore: Regional Language Centre (RELC): 165. ^ Chappell, Hilary; Alain Peyraube. "The Analytic Causatives Of Early Modern Southern Min In Diachronic Perspective" (PDF). Linguistic studies in Chinese and neighboring languages. Paris, France: Centre de Recherches Linguistiques sur l’Asie Orientale: 1–34. ^ a b Mair, Victor H. (2010). "How to Forget Your Mother Tongue and Remember Your National Language". University of Pennsylvania. Retrieved 2 July 2011. ^ a b 臺灣閩南語常用詞辭典 [Dictionary of Frequently-Used Taiwan Minnan]. Ministry of Education, R.O.C. 2011. ^ 臺灣閩南語外來詞 [Dictionary of Frequently-Used Taiwan Minnan] (in Chinese). Taiwan: Ministry of Education, R.O.C. 2011. Retrieved 8 July 2011. ^ a b 似懂非懂 (8 December 2006). 卑南覓. Hyweb Technology Co. Ltd. pp. 1873–. GGKEY:TPZ824QU3UG. ^ Thomas Watters (1889). Essays on the Chinese Language. Presbyterian Mission Press. pp. 346–. ^ 《網路社會學通訊期刊》第45期，2005年03月15日. Nhu.edu.tw. Retrieved 16 September 2010. ^ Klöter (2005), p. 21. ^ 臺灣閩南語常用詞辭典 [Dictionary of Frequently-Used Taiwan Minnan] (in Chinese). Ministry of Education, R.O.C. 2013. #2607. ^ Hsieh, Shelley Ching-yu (October 2005). "Taiwanese Loanwords in Mandarin Chinese: Language Interaction in Taiwan" (PDF). Taiwan Papers. Southern Taiwan University of Technology. 5. Retrieved 1 July 2011. ^ 參、臺灣閩南語 (PDF). National Languages Committee (in Chinese). ROC Ministry of Education. Retrieved 2 July 2011. ^ "RFC 3066 Language code assignments". Evertype.com. Retrieved 16 September 2010. ^ Norman, Jerry; Mei, Tsu-lin (1976), "The Austroasiatics in Ancient South China: Some Lexical Evidence" (PDF), Monumenta Serica, 32: 274–301, JSTOR 40726203. ^ Iûⁿ, Ún-giân. "Tâi-bûn/Hôa-bûn Sòaⁿ-téng Sû-tián" 台文/華文線頂辭典 [Taiwanese/Chinese Online Dictionary]. Retrieved 1 October 2014. Branner, David Prager (2000). Problems in Comparative Chinese Dialectology — the Classification of Miin and Hakka. Trends in Linguistics series, no. 123. Berlin: Mouton de Gruyter. ISBN 3-11-015831-0. Chung, R.-f (196). The segmental phonology of Southern Min in Taiwan. Taipei: Crane Pub. Co. ISBN 957-9463-46-8. DeBernardi, Jean (1991). "Linguistic nationalism: the case of Southern Min". Sino-Platonic Papers. Philadelphia: University of Pennsylvania. 25. OCLC 24810816. Ding, Picus Sizhi (2016). Southern Min (Hokkien) as a Migrating Language. Springer. ISBN 978-981-287-593-8. Francis, Norbert (2014). "Southern Min (Hokkien) as a Migrating Language: A Comparative Study of Language Shift and Maintenance across National Borders by Picus Sizhi Ding (review)". China Review International. 21 (2): 128–133. doi:10.1353/cri.2014.0008. Klöter, Henning (2011). The Language of the Sangleys: A Chinese Vernacular in Missionary Sources of the Seventeenth Century. BRILL. ISBN 978-90-04-18493-0. An analysis and facsimile of the Arte de la Lengua Chio-chiu (1620), the oldest extant grammar of Hokkien. Lìzhī jì 荔枝記 [Litchi Mirror Tale]. A playscript from the late 16th century. Doctrina Christiana. Manila. 1607. Hokkien translation of the Doctrina Christiana. Arte de la Lengua Chio-chiu. Manila. 1620. A manual for learning Hokkien written by a Spanish missionary in the Philippines. Huìjí yǎ sú tōng shíwǔ yīn 彙集雅俗通十五音 [Compilation of the fifteen elegant and vulgar sounds]. 1818. The oldest known rhyme dictionary of a Zhangzhou dialect. Douglas, Carstairs (1899). Chinese-English dictionary of the vernacular or spoken language of Amoy. London: Presbyterian Church of England. Medhurst, Walter Henry (1832). A dictionary of the Hok-këèn dialect of the Chinese language, according to the reading and colloquial idioms. Macao: C.J. Steyn.